The Time 4 UKBFF South Coast Bodybuilding Show is held at The Portsmouth Guildhall in Guildhall Square Portsmouth. This is a massive venue that can hold over 2000 people. The stage is huge and they have professional sound and lighting in house. The venue also has a number of bars and a restaurant serving good quality food at very reasonable prices. 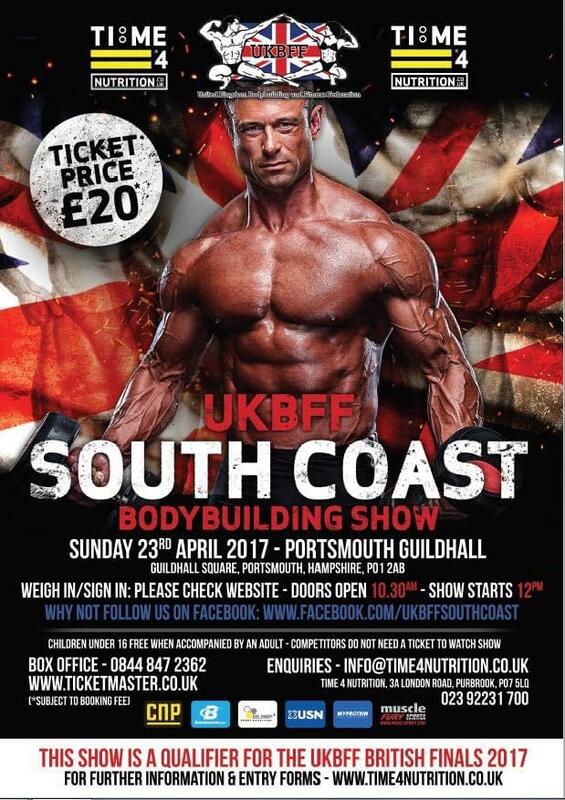 The first UKBFF South Coast show was held in 2002 and the number of competitors and the audience has grown every year with 2016 boasting over 1500 in the audience and over 200 competitors. This is a very family orientated show so we allow children under the age of 16 in free when accompanied by an adult. There is free face painting and also a best posing competition for the kids with Easter Eggs as prizes. The show is sponsored by Time 4 Nutrition and there will be a massive trade stand with free tasters to try. There are also other trade stands selling clothing and accessories. Please come and support the show. This years show is on 23rd April.